Welcome to Pleasant Valley Veterinary Services! Our mission is to provide quality, care, compassion and education to our patients and their owners by combining University level veterinary techniques and diagnostics in a warm country setting. Dr. Mary and her dedicated staff share the life-long commitment you have with your pets. Whether your desire is to have a wonderful family pet to share your home with or maintain a high level performance dog at peak performance throughout his/her demanding performance career, we will help you to achieve your goals through our extensive network of care and support services. We are located in the scenic countryside of Northwestern New Jersey, conveniently located between Interstates 78 and 80. Our clients range from NYC (a one hour drive) to outlying areas of PA and NY state. At Pleasant Valley Veterinary Services, we treat your pets like the valued family members they are. “Fear Free Veterinary Care” is a movement within the Veterinary community to employ practices within the clinic environment to minimize stress and fear when your pet comes into the clinic for any type of service. 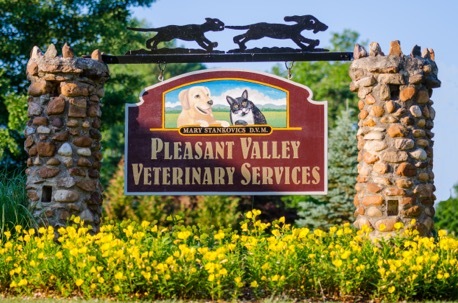 "Dr. Mary and the staff at Pleasant Valley Veterinary Services are the most accommodating, knowledgeable, and caring professionals I could have ever met in a busy veterinarian office."